Te Awamutu fencing contractor Russell Heron has switched allegiances and now uses Fence-Pro post drivers. His latest addition is the Fence-Pro Ultra G2 which has made his life a whole lot easier, thanks. Mark Fouhy went along to see what he was banging on about. If you want a fence built and you don't have time, you would ring a stock confinement engineer, as one of my friends used to call himself, otherwise known as a fencing contractor. 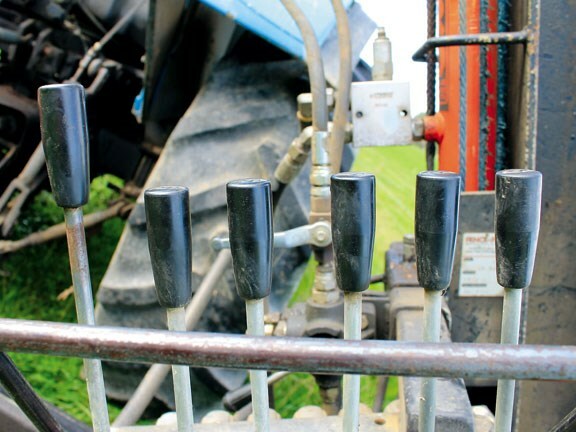 If you were to design and build a post driver for fencing, it would also be sensible to ring a fencing contractor to find out what they required/needed in a post driver. This is what Fence-Pro did with the design of its post drivers. One of the company’s main advisers for its latest model was fencing contractor Steve Knudsen, who works on the steep and rugged hill of the Manawatu and Rangitiki regions. Thanks to Knudsen’s input and the input of farmers and contractors around New Zealand, the Fence-Pro Ultra G2 was created. Russell Herron has been in the fencing business for 20 years. During this time, he’s had up to six guys working for him, clocking up about 1500 tractor/thumper hours annually. 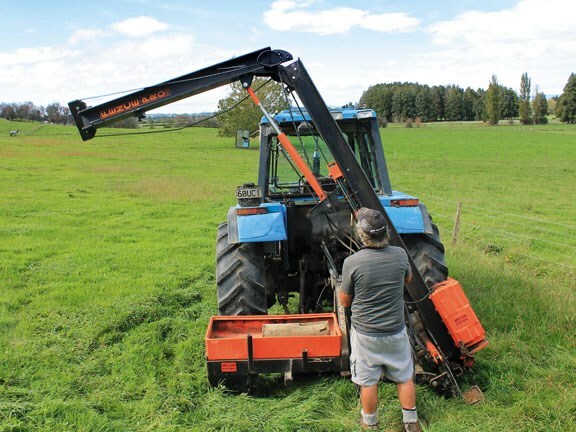 He had completely worn out three previous post drivers before buying his first Fence-Pro Thumper two and a half years ago and, so far, has been impressed with the quality of build, strength and reliability of the machine thump, post after post. I was surprised to see a nylon rope on Heron's post driver, as I thought they would be worn out in no time – a week if you are lucky. Heron admits he was initially sceptical but Nick at Maxam Machinery offered him a post driver with a 12-month guarantee, and it has not let him down yet. And although somewhat dearer at $400 apx compared to a steel one at $130 apx, it still stacks up quite well because the nylon doesn't damage the pulleys the same way as a steel one would, and then subsequent ropes don't last the same. There is also the fact that if the nylon rope does eventually snap, it’s far less likely to do someone a serious injury as opposed to flying, broken steel. Heron’s Fence-Pro G2 post driver is very well balanced and is operating with a 90hp Landini tractor, which Heron says is ideal – but you really wouldn't want to go any smaller. The design of the Fence-Pro Ultra keeps most of the weight quite low when travelling, so Heron has never had an issue with the front wheels of the tractor lifting and losing traction on a steep hill. Perhaps this is the result of a well-designed machine combined with a good operator who knows his machine and its limitations. Running the tractor at about 1200rpm (not much above) is sufficient to send the monkey up and down the mast pretty quick! This may depend on your own specific tractor make and model, but most modern tractors have pretty big hydraulic pumps and will hardly even notice the load, and it can depend on how much of a hurry you are in. The posts I thumped in only took four hits, without even sending the monkey right to the top of the mast. However, I'm sure it could be done in three. With the first post I put in, I managed to damage the top. I'm sure this can happen with most makes of post driver so I guess care needs to be taken with first contact of the post to ensure a good tidy job that will stand the test of time. The Fence-Pro Ultra can be converted to a rear mounted driver by removing three pins, connecting it up, and off you go again, I thought was an excellent idea. Side mounts are good, but there are some jobs you would be unable to do including on the side of a ridge line where you want access either side for stock. Without a rear mount you would either need another post driver or you would have to do it by hand if you didn't want to lose the job. The mast’s range of movement at 53 degrees is quite outstanding. And yes, the monkey does slide at this angle while still feeling safe, because neither the tractor nor rammer is about to fall over onto you, making it usable in more places. This allows posts to be thumped in easily and accurately, in the likes of kiwifruit orchards for example. 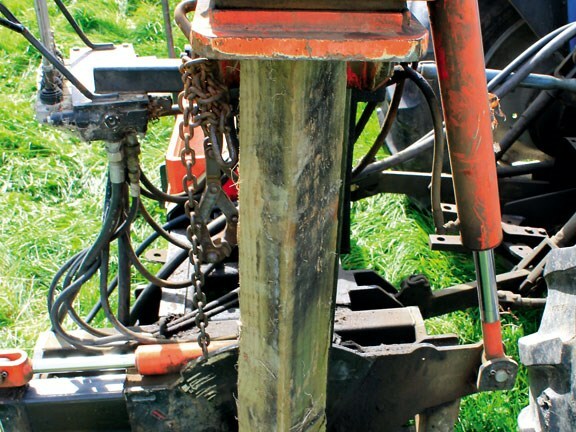 The range of hydraulic movement available, means thumping posts is an easy one-person job. My experience with post drivers has mostly been of the economy/farmer type model, where it seemed to take as long to get on and off the tractor and set it up as it did to dig the post hole. But because of Fence-Pro’s excellent range of movement, this is not the case. It doesn’t take long for the logical layout of the controls on the hydraulic to become second nature. The up/down of the monkey lever is about an inch longer than the rest of your controls, and the guard for the controls is in the right place to avoid accidentally bumping leavers when backing into tight spots. To save repair time, Heron has a nylon block, which is louder but harder wearing. I am unsure if his mast is the 4.5m or 4.8m model, but it is hinged with a hydraulic fold with a lever/tap system that’s not on your control valve, so it doesn't get bumped accidentally and you don't have to get back on the tractor to fold it either. The ease of folding means you can fold the mast in less than a minute which then keeps the weight lower, saving wear on your main pivots and joints. If you make it standard practice then you won't end up taking down low overhead wires. The ability to thump in load out race posts, including the tallest ones would be a real plus especially for a fencing contractor who constructs multiple sets of yards each year. The Fence-Pro Ultra G2 can come spec’d up with rock spikes and augers, but for Heron, the extra cost, extra weight and the amount of work he needed it for meant he opted not to have these features. On the rare occasion that he can't thump a post in, he gets a digger to bore the holes for him. There is also a handy toolbox mounted to the side of the rammer, which is a great addition as there never seems to be enough room for hammer/staples/ezy pulls in the tractor toolbox. The holes in the frame mean you can carry a rammer and spinning jenny with you as well. I was very impressed with the Fence-Pro Ultra G2 overall, and I went home having learned more about post drivers than ever before – now I know what to look for if I’m ever in the market for one. Some of the key features include the safety mechanisms and ease of operation, ability to spec for your situation/requirements, reliability and durability, including how many thousands of posts you can thump in before you have to do anything other than grease it. In terms of price, the cheapest model is not always the best in the long run. The Fence-Pro Ultra G2 is a great machine that is proven on steep slopes, is low maintenance, has great movement and can transform easily from a side-mount to a rear-mount, meaning the versatility is priceless for a contractor. What is also great about this brand is that it also offers lower spec models, still built with the same reliability, but more suited to those with a tighter budget and/or not using them regularly. Heron is very happy with the way his machine is going and is pleased with his decision to change to switch to the Fence-Pro brand. Huge range of movement/adjustment means post driving easily carried out by one person. Design of the feet: because of the rammer’s range of movement the feet can disturb quite a bit of grass/soil. Fence-Pro does make a roller foot option which may well solve this problem.